I'm enjoying (sort of) a little vacation given that the institution I work at is closed for the holidays. I have a lot of composition stuff I'm working on these days which equates to some exhausting mornings and a lack of practicing the pieces I'm working on. Anyway, I've been meaning to write a little post for some time on one of my all time favorite films, and arguably the film that most changed the direction of my life, Milos Forman's "Amadeus". This movie is one of three I credit with having an enormous influence on my life, the other two being "Star Wars" (yes, I call it "Star Wars" not a "New Hope") and "Sholay". The former probably did more to instill a perhaps naive and childish optimism in me, the latter – almost to the contrary – taught me that doing the right thing is often not glorious, but painful. 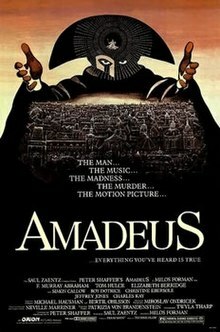 But "Amadeus" is the reason I got into Music more than anything. It also is likely the first film that made me aware of film as an art and not this mystical audio-visual experience that "Star Wars" and "Sholay" were for me, given that I was much younger when I first watched those. There was so much talk about F. Murray Abraham's and Tom Hulce's performances, that I couldn't *not* be made aware of it as a cinematic product. For all three films, I estimate I've easily seen "Star Wars" over 100 times, and I've probably seen "Sholay" and "Amadeus" at least 50 times each. I could still watch "Star Wars" with relative ease but watching "Sholay", given the ending, is a bit of trying experience, most especially during the song "Yeh Dosti" which foreshadows the tragic ending of the film; but if I wanted to watch it again I could do it. In contrast, I recently tried to watch "Amadeus". I just couldn't. And perhaps I don't need to anymore. I think the biggest factor was that I had the director's cut and all the extra scenes were really jarring to me, it was like discovering an undesirable dimension to a person I thought I knew well. It's somewhat like how Music has changed for me, too. It's no longer a mystery, it's work, work that I enjoy most of the time. Anyway, there's a good comparison between the theatrical/director's versions here (warning: there might be some movie poster images on the website that you might not want to see). In large part, I think the theatrical version is far better. The director's cut has … how does one say? … "too many notes". The only thing I really found interesting about the extra scenes was how much food played a part in Salieri's life, as if his denial of other worldly pleasures had led him to gluttony. But F. Murray Abraham is too thin for that to work and also by hiding some details about his flaws and his conniving as in the theatrical version, I think he more effectively comes across (in the theatrical version) as a symbol of jealousy and the rightful patron saint of mediocrity.